What better way to celebrate it being a random day of the week than a box of free donuts? That's exactly what Krispy Kreme is serving up this week. 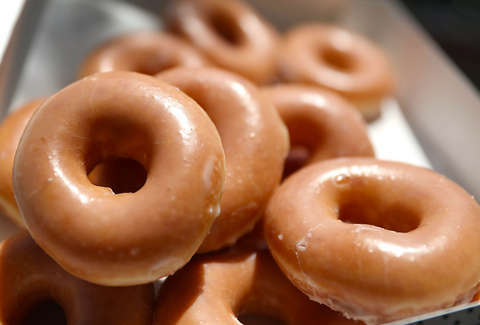 The chain is offering a dozen of its Original Glazed donuts for free with the purchase of another dozen donuts at regular price, according to a company spokesperson. That means you can load up on its limited run of all-new filled chocolate donuts and bring home a bonus dozen. By the way, those filled donuts are chocolate versions of its classic filled donuts, including Cake Batter, Raspberry Filled, Chocolate Iced Kreme Filled, and Oreo Cookies & Kreme donuts. It's a perfect deal for those days when you'd like to buy a dozen donuts for the office but also want to eat a dozen donuts yourself. The deal will run from Monday, January 14 through Sunday, January 27. To redeem the offer, you have to sign up for Krispy Kreme Rewards, the donut shop's rewards program. You can do so by downloading the Krispy Kreme mobile app or signing up at the chain's website. Then boom, your morning is full of the same joy Homer felt when he was put in donut hell.